Since 1998 Victoire de Castellane has been the aristocratic creative director of Dior Joaillerie and she has secured the supersonic French fashion house as a go-to for fabulous fine and high jewellery. Her latest collection is ‘Soie Dior’, launched in the week that the world flocked to Paris for its Autumn/Winter couture collections. It pays homage to the silk ribbons used abundantly in couture clothes. Gold appears to have been melted down and modelled into ribbons set with diamonds and coloured gemstones in every cut imaginable: brilliants, pears, marquises, baguettes and ovals, to depict the movement of silk falling from ears, around necklines into cleavages and weaving about wrists and fingers. ‘Soie Dior’ follows on neatly from another recent collection based around the world of couture. ‘Archi Dior’ takes its name from Monsieur Dior’s way of constructing his clothes as though an architect, which he had at first aspired to be. Castellane has taken some of the most definitive designs such as Dior’s Bar jacket from his Spring/ Summer 1947 ‘Ligne Corolle’ collection and turned it into a gemstone-studded bracelet. The 1949/50 long-skirted Junon evening dress and its rippling lines on the flower-petal skirt translate to a pair of diamond earrings. 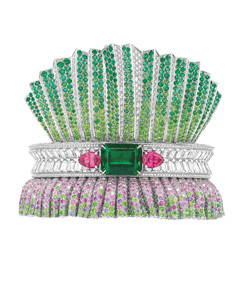 If ever the worlds of diamonds and dresses marry, it is under the watchful eye of Victoire de Castellane.